Last night, Evan invited me over for dinner and a backyard bonfire. I hadn't been to his new house yet either; so it was fun to finally see his new (spacious!) digs. 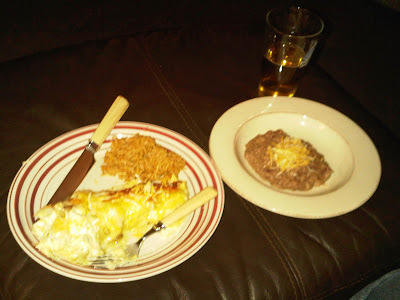 He cooked a whopper of a meal: cheesy chicken enchiladas (can you believe until yesterday I had never had an enchilada? ), spanish rice, homemade refried beans and a nice cold cervasa. Muy impresionante! It was very good. 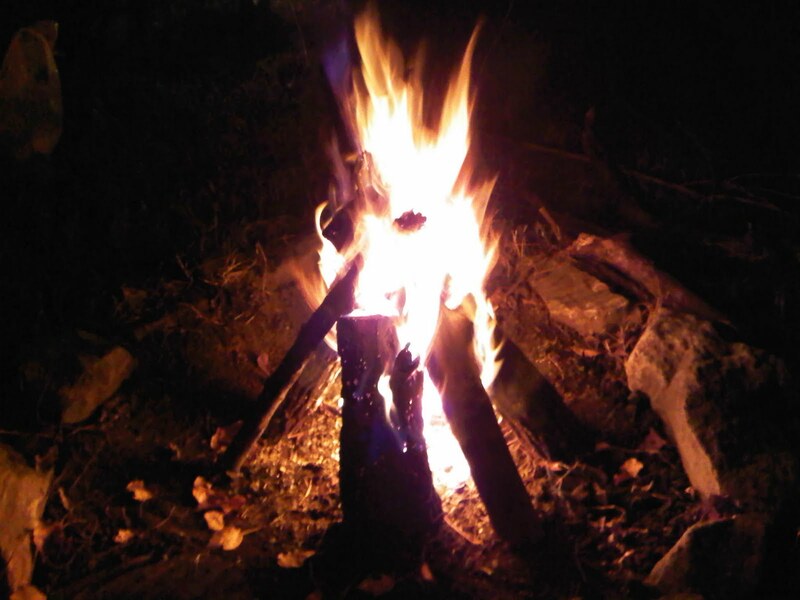 After dinner, we went outside and Evan made a great big fire. We got bundled up, collected the smore necessities, our cervezas and some chairs and promptly realized... we were locked out. Oh well. Good thing the marshmallows and chocolate made it outside first. After Evan ruined salvaged the fire, it was smore time! 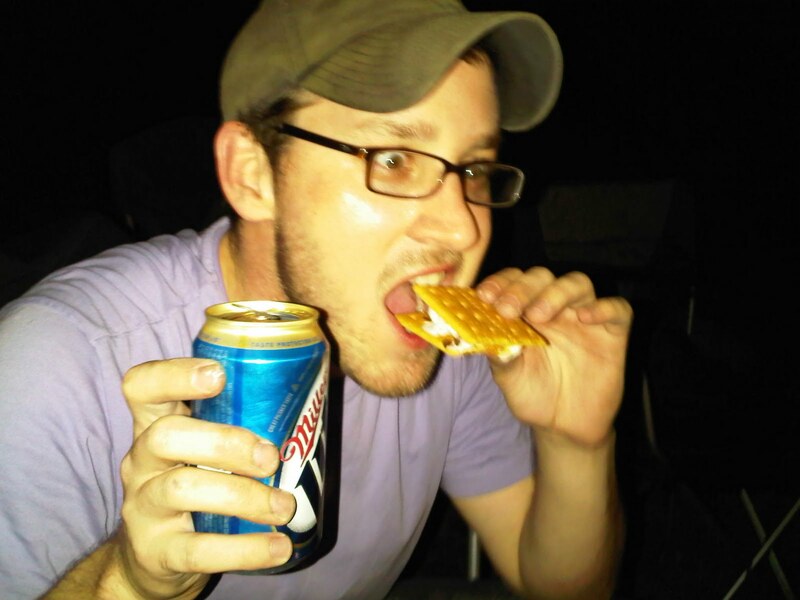 I like to melt my chocolate on the graham cracker, next to the fire, while my 'mallow is roasting. 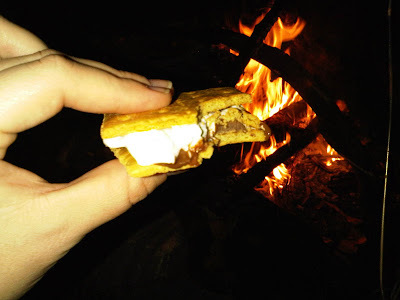 Evan has discovered another way to make a smore involving chocolate chips stuffed into the marshmallow itself. "When the 'mallow's flaming, you stick it on the chocolate and cover it with the other end. Then, you scarf. Messy, but good!" Eventually, Elliott got home and let us inside, but only after he pointed out that the door was never locked to begin with. It's just a stubborn knob. Oh well. How was I to know that? You're SO very welcome! Your company is always welcomed. It's about time I made it back onto Pearls. It has been a while ;) love you, dear.